by Rick Mills. South Dakota State Railroad Museum, LTD., 87 pages, softcover. 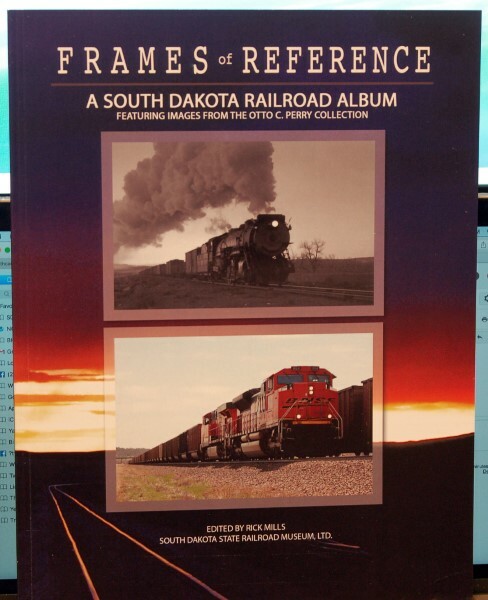 Frames of Reference, A South Dakota Railroad Album, the latest book from Rick Mills and the South Dakota State Railroad Museum, combines many qualities that appeal to the rail fan: photos of locomotives, trains, scenes then and now and the pictures from the photographic genius of Otto C. Perry. The author was introduced to the Colorado lens man while visiting the Colorado Railroad Museum as a lad and actualized the idea of a photographic tribute to Perry and South Dakota with the publication of this book in 2017. Mills selected 57 Perry photographs for inclusion in the book’s 87, pages then supplemented them with additional images from the Museum collection and other local photographers. The result is an attractive composite of shots from Perry’s camera dating back as far as the 1920’s up to the late 1960’s throughout the state of South Dakota. Sprinkled amongst them are contemporary snapshots by Mills and others from today. Many are set in the state’s lovely Black Hills which adds to the appeal for Colorado mountain rail fans. Including the always interesting “then and now” feature is an effective touch. Many of the scenes display very accurate replication of the setting in the pictures from the past to the present, some of the latter in dramatic color. Another catchy technique is the use of the image of a vintage baggage tag to label the photo and its contents. Interesting photo details are included on the tag such as date, location, wheel arrangement, type of train and its speed. This cleverly titled book will appeal not only to residents of the Mt. Rushmore State but anyone interested in the photography of Otto C. Perry and historic railroading scenes as well. This attractive soft-cover book is now available in the Colorado Railroad Museum Gift Shop or through the museum’s web site.